Summertime and flea control are nearly synonymous when you have pets. Keeping your home free of fleas requires more than flea baths and medications for your dogs and cats; you must take care of the problem at the source. Fleas do not start inside. Pets and even people bring them inside. Some simple home remedies for your yard can help you achieve the destruction of fleas. Nematodes are an excellent method of flea treatment for the yard. They are tiny worms that can't be seen with the naked eye. They prey on fleas and many other pests, along with their nests, cocoons and larvae. Nematodes come in packages; you mix the organisms with water and spray them across the lawn. Boric acid is the main ingredient in commercial flea powders. It is very safe and effective when used according to directions. It is possible to buy raw boric acid and create your own flea powder, but it is ill advised. In order for boric acid to remain a safe flea powder, the proper proportions are important. Boric acid is poisonous at the wrong levels. Spread liberal amounts of commercially prepared flea powder on lawns, flowerbeds, gardens and pathways for excellent flea control. Diatomaceous earth is not really dirt. It consists of the fossil remains of hard-shelled freshwater organisms. The tiny fossils have very sharp edges. Used heavily to improve garden soil, diatomacious earth also works to kill pests by slicing into the coating that covers the flea and causing dehydration. Diatomaceous earth comes in three common grades: pool grade, food grade and horticultural grade. The latter two are best for use on the soil to control fleas. Pool grade will have little impact on flea populations because of the chemical heat treatment used in its preparation. Simply spread liberal amounts of diatomaceous earth along pathways, decks, sidewalks and garden areas and on lawns. For serious infestations where nothing else destroys the flea population, lime is an alternative. It should be the last resort after all other options have failed, because lime is very caustic. It is hard on the land and hard on the skin of people or animals that come in contact with it. Lime is a common element in garden and lawn improvement, though not in the quantities used for flea control. Putting lime on a lawn can cause it to die off so there needs to be an element of desperation before you are willing to chance burning the ground to kill pests. Lime works for two reasons. First, it burns and dries up the fleas themselves. Second, it burns and dries up the lawn. Fleas and other pests, such as ticks, like long, lush lawns because the thick blades shade them from the sun's harsh rays. 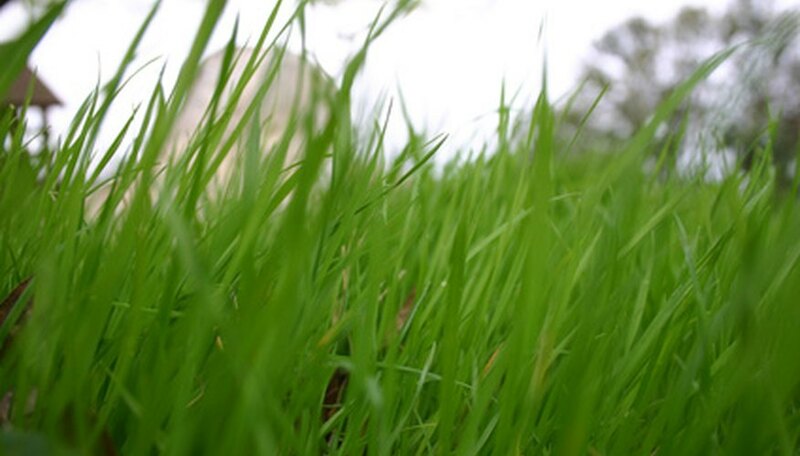 A burned, dried-out lawn leaves fleas exposed to the sun's heat, which kills them. The main reason for the failure of these solutions is lack of follow-through. The life cycle of the flea makes it resilient to many efforts to get rid of the creatures. Flea eggs are usually unscathed by chemicals. With the exception of nematodes, treatments only kill the adults of the species and not the larvae or eggs. Flea eggs hatch every two to three weeks, so treatments must be applied on a two-week schedule to keep killing off new infestations before they can lay more eggs. It normally takes three or four cycles to eradicate a heavy infestation. When spreading any flea-killing preparations, even natural remedies, wear protective clothing and gear. Long-sleeved shirts, pants and gloves protect the skin from exposure to the harsh ingredients. Always wear a dust mask to prevent inhalation and goggles to protect the eyes. Flea Control Guide: What are Nematodes, and How Do They Kill Fleas? Flea Control Guide: Boric Acid--Does It Kill Fleas?